For Norm Taylor the inspiration for giving to UFV is all around him. 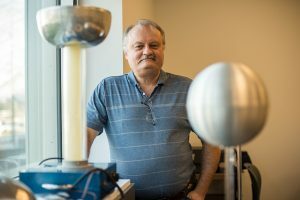 Norm, who works as a lab instructor at UFV, has been a steady presence in the Physics department for 24 years, joining in 1993 as UFV prepared to launch a Bachelor of Science degree. And he’s been a donor to UFV for almost as long, first signing up for payroll deductions in 2001. Thanks in no small part to the generosity of Norm and others like him, UFV now offers Physics Excellence annual scholarships to the best physics student in each of years one through four. A significant number have gone on to master’s and doctoral level work in physics and successful careers. Norm benefited from post-secondary himself, starting out at Cariboo College (now Thompson Rivers U) before transferring to UBC because upper-level courses weren’t available at regional post-secondary institutions in those days. He earned a Bachelor of Science with a major in physics as well as a BA in international economics. In addition to his work as a lab instructor at UFV, he has served on the executive of the Faculty and Staff Association. 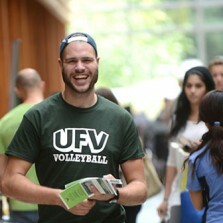 Find out about student awards at UFV.